For brides in search of a feminine wedding ring with some unique flair, two-tone flower wedding bands can be an ideal option. These bands come in a variety of lovely designs. According to the traditional rules of fashion, all your jewelry should be the same color. While most modern women bend or break this rule on occasion, it can be there in the back of your mind when you're selecting a necklace or earrings for a special event. Since you will be wearing your wedding band for the next several decades, it's nice to have options. A two-tone band lets you mix metals without offending any fashion police you might encounter. , using two metal colors makes it possible to create realistic and eye-catching vines, leaves, and petals. For centuries, brides have worn or carried flowers on their wedding days. Flowers are associated with femininity, and their beauty is celebrated in many different kinds of jewelry. Floral wedding bands are popular with brides who love girly style, those who value nature and the environment, and those who simply love the look of rings with pretty blooms. Which metals would you like? Two-tone rings can include any combination of white gold, yellow gold, rose gold, sterling silver, platinum, and titanium. Are you looking for something simple or elaborate? Consider your usual taste in jewelry and fashion when deciding on a wedding band style. What is your budget? You can find affordable two-tone floral rings in sterling silver and yellow gold. Some more luxurious options include diamonds or other gems. You favorite local jewelry shop may have some two-tone flower rings in stock, and it can be helpful to get a sense for how these bands look on your finger. Although the selection of designs may be more limited than with online shopping, you may enjoy dealing with a jeweler face-to-face. Alternatively, you can find some beautiful floral rings in antique shops. Flower motifs were popular with the Victorians and also figured heavily in Art Deco wedding rings. Take your time, and browse through the merchandise carefully. Most antique rings can easily be resized to fit your finger. You can also have a two-tone flower ring created especially for you. Custom jewelers specialize in making unique wedding bands that meet clients' specifications. Ask around at local art galleries to find a custom jeweler who can help you create the flower ring of your dreams. No matter where you buy your two-tone flower wedding band, be sure to request an appraisal to make sure you're getting a good deal. 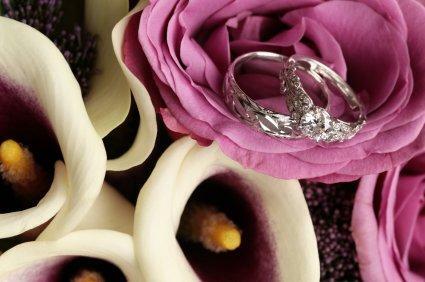 Doing your homework about flower ring styles and materials is the first step toward buying a ring you really love.